At the Royal Alexandra Theatre, Toronto, Ont. 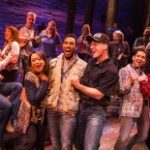 The Canadian production of Come From Away has landed at the Royal Alexandra theatre for an open-ended stay, and it is glorious! The Story. Is there anyone in this country (for starters) who doesn’t know the story of Come From Away and on what it’s based? Ok, for the three people who might have been stuck on an ice-flow for five years in the Northwest Territories, Come From Away is a musical based on what happened on 9/11 and a few days after to people stranded in Gander, Newfoundland and the people there who took care of them. When the terrorist attacks happened on 9/11 no U.S. bound plane was allowed to land in the United States. Two hundred planes were diverted to Canada. Of that 200, 38 were diverted to Gander, Newfoundland. Gander was once a thriving huge airport used by transatlantic flights to refuel. The creation of jumbo jets meant they did not need to refuel. The result was that Gander could now get six flights a week that used the airport. On 9/11 38 planes, carrying 7,000 passengers descended on the small community of Gander. Those passengers had to be housed, fed, tended to, cared for and comforted because initially they didn’t know what happened or why they were diverted. When they found out they were terrified. Over the several days those people were in Gander and the surrounding towns, the townsfolk went into action carrying for these frightened people who had come from away against their will. Friendships were formed. Trust and consideration were established. Lives were changed. And then the folks were allowed to board their planes again and continue their journey leaving as many stories behind as there were people who experienced them. Writing and life partners Irene Sankoff and David Hein were asked to write about that Gander experience by Michael Rubinoff, Head of the Musical Theatre Performance Program of Sheridan College. Sankoff and Hein conducted thousands of interviews with people in Gander and those who were stranded there. The result is the book, music and lyrics for Come From Away. The Production. It starts with the pulsing, driving beat of “Welcome to the Rock”, a song that establishes everything you need to know about the place and people of Newfoundland—it’s a remote island off the north-east tip of North America. If you ‘come from away’ (translation: don’t live on the island and come from elsewhere), “you’ll understand about half of what we say.” The weather is the wildest you’ve ever heard of. The people are self-deprecating, funny and kind. They will offer you safe harbour, a candle in the window, an open door and a cup of tea and ask for nothing in return. Sankoff and Hein wrote that song to go like a bat out of hell. It has a throb like a heart beat or the pounding of waves on rocks, or the thrum of a plane’s engine. It establishes the breathlessness, the pace, speed and urgency of the piece and that pace doesn’t let up until that last driving note of the last song. Because the cast of 12 play various roles and they are almost never off stage, costume changes are carefully done almost in front of our eyes like magic. Almost every member of the cast is Canadian. Without exception they realize the quirks, tics and individuality of the folks they play. They all sing beautifully and with conviction. Eliza-Jane Scott as Captain Beverley Bass sings the heart and soul out of “Me and the Sky.” The notes soar effortlessly and with joy at being the first woman pilot for American Airlines, until the last devastating moments of the song. George Masswohl as Claude among others, is imposing yet impish as the mayor. Lisa Horner plays Beulah, a Gander native gracious host with selfless kindness. As Diane, one of the passengers who finds true love, Barbara Fulton leaves her respectable demeanour somewhere and plays Diane with a funny abandon. Kristen Peace realizes Bonnie’s feistiness when it comes to taking care of her four legged friends on the planes and to hell with authority who says no. Saccha Dennis breaks your heart as Hannah who is anxious to hear from her fireman son. Steffi Didomenicantonio plays Janice with all the anxiety of a woman who just started on the job as a reporter. She is breathless flitting from one story to the next and certainly when Tom Brokaw (TOM BROKAW!!!) calls for details. James Kall as Nick is a very proper and endearing charmer from England who befriends Diane. Ali Momen as Kevin is less than happy to be in this remote place and certainly when his partner Kevin (Kevin also, it was cute for a time) is getting into the spirit of the situation. Momen also plays Ali, an Egyptian man on the plane and beautifully realizes all of Ali’s discomfort and isolation in that situation. Jack Noseworthy as the ‘other’ Kevin is relaxed and good-natured in this situation. Cory O’Brien as Oz is the kind-hearted, considerate cop who helps at all times. And Kevin Vidal as Bob makes a lovely transition from a man who is suspicious of everyone and wonders how he can protect his wallet, to a man who is affected positively by all the kindness he finds in this strange place. It is tempting, I’m sure, to note how this production stacks up with the original production that played here on its way to Broadway last year. I’m not going to do that. Why would I? It doesn’t matter how anything compares to anything else if this is the production our audiences will be seeing. Suffice to say this production is full of life, joy, chest-thumping pride, sterling talent, powerful voices and a cast that can realize the heart-shredding emotion of the piece and the foot-stomping thrill of it too. And they do it in their own individual way. Comment. Irene Sankoff and David Hein have said that Come from Away is not a 9/11 story; it’s a 9/12 story—it’s what happens after the planes land in Gander. It’s also not a Canadian story. It’s a Newfoundland story. Those folks are just different. With kindness, consideration and selflessness, they opened their homes and their hearts to strangers who needed help and comfort. That generosity of spirit was returned by the ‘strangers’ who quickly became friends. It’s the story of how lives can change when people are treated with love and consideration. It’s a wonderful story told in this glorious musical and yes, in these troubled times, this show is needed. See it and take Kleenex. Running Time: 100 minutes, no intermission.